When markets are volatile, it can be challenging to be an investor. Volatile market conditions may cause investors to worry about the value of their investments and what action should be taken. Investors may find themselves thinking short-term rather than longterm, as market conditions make it hard to focus on investing for tomorrow. If you have these concerns, you are not alone. Anxiety over volatile markets is a common investor reality, and is certainly understandable. Yet it can also be managed for the best long-term result—by talking with your Financial Advisor to determine the appropriate course of action. ¹ Source: Barclays Wealth Management/Cass Business School and Dalbar. What Action Can an Investor Take? Here are some approaches to dealing with the concerns brought about by volatile markets that you may find helpful in the short- and long-term. In volatile markets, your Janney Financial Advisor can play a very important role. Together, you can discuss changing market conditions and refine your longterm strategy, allowing you to make objective, strategic portfolio decisions. Your Financial Advisor can also help you to put market events into perspective. Using historical data, your Financial Advisor can help you to understand where we are in the current economic cycle and how this market may—or may not—compare to markets of the past. Asset allocation (the percentage mix of stocks, bonds and other investments in your portfolio) accounts for over 90% of the variation in return of an investment portfolio (Brinson, Hood and Beebower). It may be the most important aspect of your portfolio to evaluate. Your Financial Advisor can help you take a fresh look at your asset allocation given your risk tolerance, future goals, and current market conditions. 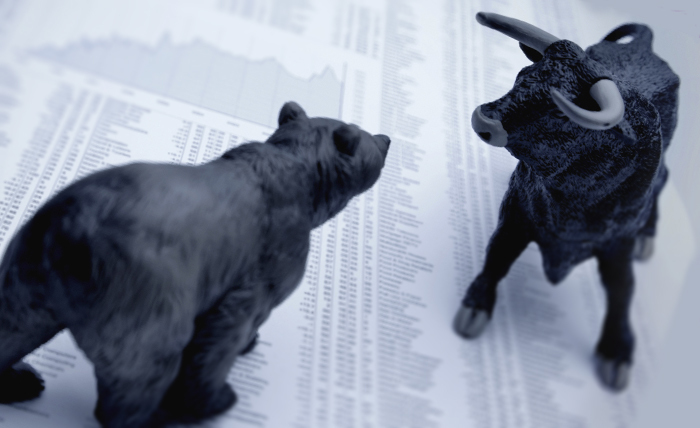 Stock markets are cyclical, and have risen and fallen dramatically over the years—through both bull and bear market cycles. Often, large increases in value follow major downturns—and the upside move can be shortlived and dramatic. While it may be challenging to “stay the course,” historical data shows that over the longterm, having an allocation to the equity markets makes sense for most investors (see chart below). Ask your Financial Advisor to review your largest holdings and the composition of your portfolio. It is important to understand why you hold your investments and how changing market conditions may affect them in the long-term and short-term. You may find that you are comfortable with the holdings and areas of the market in which you are invested—or, you may choose to make adjustments in your portfolio, working with your advisor. Your asset allocation and sector weightings – Are the mix of stocks, bonds and other investments in your portfolio ideal for your goals and in these markets? The quality of the investments you hold – Are you comfortable with the credit ratings and other fundamental characteristics of your investments? Your risk tolerance – Is your portfolio still aligned with your goals and comfort level? Are you able to sleep at night with what you hold? Should any adjustments be made? Income needs – Should dividends from stocks or income from bonds or annuities play a larger current or future role in your portfolio? Volatile times can make the development of a financial plan an even more valuable step. When markets are volatile, you may be even more interested in the answers that a new or updated financial plan can offer you. In any market environment, completing a financial plan with the help of your Janney Financial Advisor can help you to determine when you may be able to retire, how long your assets may last in retirement, how you can transfer wealth today and tomorrow, and how best to position your investments for the future. You may find that you are on track, providing important peace of mind. Alternatively, you can identify positive changes you can make today to help meet your financial goals tomorrow. These are questions that can be answered by completing a financial plan with the help of your Financial Advisor and the experienced Wealth Planning team at Janney. In volatile or “flat” markets, dividends can provide useful income that may become the major portion of a stock’s investment return. Adding high quality equity investments with solid dividend yields to portfolios makes sense for many investors when markets are volatile. You can also consider investments in separately managed accounts of professional investment managers or mutual funds for enhanced diversification, like many institutional investors do—to help minimize risk and potentially enhance return. This can “shift” some of the weight for decision making to these managers, who are close to the markets and objectively research investments for diversification and increased emphasis, or, alternatively, for sale. Many bonds have low or negative correlation to stocks—and typically move in a different direction than stocks do. Many commodities have low correlations with stocks. History has shown that some alternative investments, like hedge funds, managed futures and private equity, can also move in directions different than those of other types of investments—like stocks. Certain types of annuities can offer significant downside protection that can be useful to investors. In addition to providing guaranteed lifetime income, an annuity can include both an investment value that can increase or decrease based on the markets—and a guaranteed benefit amount that will not decrease when markets decline, and will increase by a specified percentage each year. The guaranteed benefit amount is calculated based on a specific return on the investor’s retirement assets for a 10 year period or longer. A guaranteed benefit amount is only the value used to calculate the annual lifetime income amount. Though it helps you generate stable income, it is not available for a lump sum withdrawal. There is investment risk associated with variable annuities and, upon redemption, the value of an annuity may be worth more or less than the original investment. Any annuity guarantees are subject to the claims-paying ability of the issuing insurance company. Establishing a pattern of investing that is unvarying despite market volatility can benefit you during market declines. If, for example, you invested $1,000 a month under a systematic investment plan, you may find that you can purchase more shares of a given stock in down markets than you can in strong markets. When the markets recover, you will have benefitted particularly from your purchases during down markets. For more information and to implement some of the steps outlined above, please contact your Janney Financial Advisor, who will be pleased to assist you. You can also review the market insights of Janney’s Investment Strategists as they evaluate the current market environment. These publications are located on www.janney.com. Disclosure: Some of the investment concepts and products discussed may be highly illiquid and may only be offered to clients who meet specific eligibility requirements, including minimum net worth, income tests and investment experience. All investors should carefully review any offering materials, and prospectus(es) which will contain the information needed to evaluate a potential investment and provide important disclosures regarding the investment’s strategies, risks, fees and expenses. Asset allocation and diversification do not guarantee investment returns and do not eliminate the risk of loss. Past performance is not a guarantee of future results, and investor returns may vary. Systematic Investing or Dollar Cost Averaging doesn’t guarantee a profit or remove the risk of a loss in a declining market. Dollar Cost Averaging involves a continuous investment in securities regardless of fluctuating price levels of such securities. An investor should consider his/her financial ability to continue participating in a Dollar Cost Averaging plan. Past performance is no guarantee of future performance and future returns are not guaranteed. There are risks associated with investing in stocks such as a loss of original capital or a decrease in the value of your investment. This report is provided for informational purposes only and shall in no event be construed as an offer to sell or a solicitation of an offer to buy any securities. The information described herein is taken from sources which we believe to be reliable, but the accuracy and completeness of such information is not guaranteed by us. The opinions expressed herein may be given only such weight as opinions warrant. This Firm, its officers, directors, employees, or members of their families may have positions in the securities mentioned and may make purchases or sales of such securities from time to time in the open market or otherwise and may sell to or buy from customers such securities on a principal basis.